Pardon his mouth. Kornheiser meant no harm. 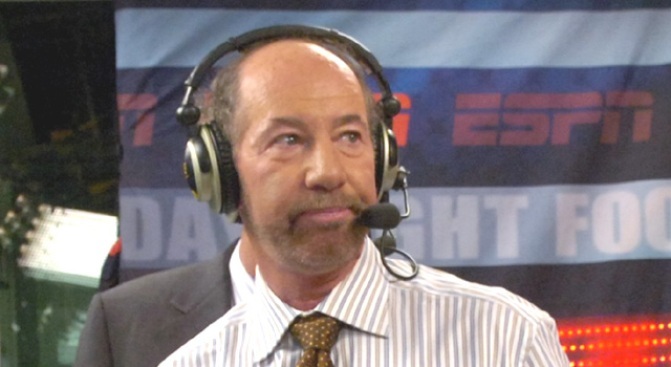 ESPN suspended Tony Kornheiser indefinitely after last week's remarks about Hannah Storm's outfit on "Sportscenter," the Huffington Post reported. The rant on "The Tony Kornheiser Show" on ESPN980 followed Storm's Feb. 16 "Sportscenter" appearance. "Hannah Storm in a horrifying, horrifying outfit today. She's got on red go-go boots and a catholic school plaid skirt ... way too short for somebody in her 40s or maybe early 50s by now...She's got on her typically very, very tight shirt. She looks like she has sausage casing wrapping around her upper body ... I know she's very good, and I'm not supposed to be critical of ESPN people, so I won't ... but Hannah Storm ... come on now! Stop! What are you doing? ... She's what I would call a Holden Caulfield fantasy at this point." The former Washington Post columnist will be suspended "for some time" from "Pardon the Interruption," the show he co-hosts with Michael Wilbon, ESPN said. Kornheiser apologized on his radio show and said he called Storm personally to apologize to her. He said it's not the first time he's had to apologize and won't be the last time. For that, too, he is sorry.